Game-designer Shigeru Miyamoto of Nintendo discusses sharing culture in gameplay. 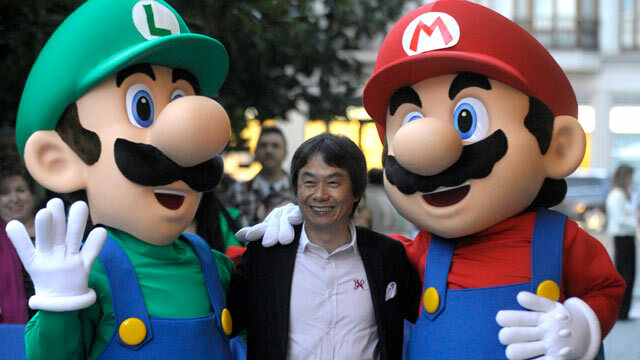 Miyamoto, center, poses with game stars Mario Bros and Luigi, Oct. 25, 2012. If Sony and Nintendo's emerging generation of video-game home consoles have any common thread, it is social network integration. Sony announced last month that it is adding a "share" button to live-broadcast social gameplay with the upcoming PlayStation 4, touting a Facebook partnership to boot. Meanwhile, Nintendo has grown a social network of its own with Wii U's "MiiVerse," a PG-rated community of tips and drawings within their console hub. We had a chance to sit down with Shigeru Miyamoto, the renowned Japanese creator of "Super Mario Bros." and "The Legend of Zelda," while he was in New York to promote "Luigi's Mansion: Dark Moon" and "Pikmin 3" to get his take on the future of sharing live gameplay via social media, as well as answers to many of our burning questions revolving around Super Mario's world. Q: Watching people play video games has evolved into a whole subculture. On YouTube there are millions of viewers watching people play. What does social media mean to you as games evolve? A: The way that we use the ghost data in "Mario Kart" is a good example of that. When you're playing "Mario Kart," you can record how you've played through the course with your ghost data and you can share that ghost data with other people, which allows them to then compete against you even though you're not in the same room or even playing at the same time. And similarly now, of course, with YouTube it's become very easy to simply take a video of what you've played and post it on YouTube for other people to see. Then you can look at the next evolution of that with games like "New Super Mario Bros." for Wii, and super-play mode. And separate from that, in "Ocarina of Time 3D," that game also had these short movies that essentially served as hints about what to do next. And so what we were able to do is through the game program we were able to build systems through which you were then able to get information that typically would be included in something like a strategy guide. Similarly, we're able to then use systems similar to that to then also create videos that were sharing. For example, with "New Super Mario Bros." for Wii U, through MiiVerse and using YouTube … we're posting videos of super-play to the MiiVerse community with links so people can go to YouTube. I'm not very big on broadcasting my opinions, so I haven't used Twitter all that much. But I do use Facebook quite a bit to communicate with friends. Q: What was your first reaction when the MiiVerse went live and players began to post so many intricate drawings, putting a ridiculous amount of time and energy into their doodles? A: Whether it was MiiVerse or "Flipnote Studio," when we first are working on projects like that and we, as the developers, are creating things with those sketches, our immediate first impression is that these are fun things to play with but certainly unless you're really a professional, it's going to be very difficult to draw great pictures. And, yet, what we find in both of those cases, the average consumer is able to far exceed our expectations of what they can do. What's interesting is that certainly within the structure of those systems, whether its MiiVerse or Flipnote, you do have a certain amount of limitations in terms of what you can use and how you can draw. And so what we're finding is really sort of a competition between people to show the level of their skill within their constraints. So that certainly has been very interesting. Obviously, with video games, certainly it's important to have games that create these massive and expansive and very detailed gaming worlds. But at the same time for players, there's a tremendous amount of fun to be had from playing a game, or in this case drawing something, within a set of constraints, and then trying to improve and do your best within those constraints to see how good you can do. Q: A "Zelda" book ("Hyrule Historia") was released earlier this year, which turned out to be a New York Times best seller. Do you have, in your mind's eye, a vision of the story and world of Mario that could be laid out in a book? Maybe even a map? A: I don't have a map in my head. Trying to create something like that, that was so hard that's actually why we decided to fly off in a different direction with "Super Mario Galaxy." That's a facet that's very important for the "Zelda" games. We spend a great deal of consideration when creating a new game in terms of how it fits in with the other stories. Q: "Nintendo Land" very much teased us, and everyone wants to actually go to Nintendo Land in person. Have you ever been approached about a Mario theme-park, or is that ever something you would consider in real life? A: Certainly, with Nintendo being in the entertainment industry, there may come some point in the future where that might become a possibility. But right now we've got our hands full creating our digital products. Certainly, it's not an impossibility. Q: What's the most fun you've ever had working on any game? A: Actually, I have a lot of fun making all the games, even surprisingly the ones that have a lot of challenges to solve or they take a lot of time to finally bring together into final form ... even those ones I have a lot of fun, and the ones where we have a lot of freedom to make the games, those are fun to make. But, I guess, thinking back, probably "Super Mario 64" and the original "Legend of Zelda: Ocarina of Time." That era was the first time we were taking games and bringing in this new 3-D technology, building the rules and the framework through which games would be depicted in 3-D, I think, probably made those the most fun games to work on. In working with some of the younger staff members, and when they have a question on a project and say, "I don't know who to go to to find the answer to this question," I'm always the type that says, "Well, if you don't know who has the answer, then simply make the answer yourself." I have a lot more fun when we're making up the rules as we go along. Q: So the frustrating times are also the most enjoyable? A: The higher the hurdle, the more fun it is. Stay tuned for Part 2 of this interview when we review Luigi's "Mansion: Dark Moon" later this month.